Can This Sprawling, Immersive Exploration of Surveillance ‘Change the Face of Culture’ in Bushwick? 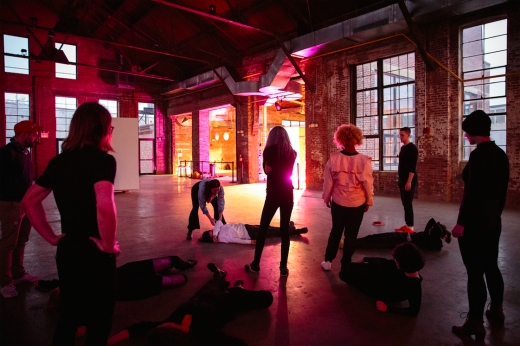 On May 20, the 50,000-square-foot Knockdown Center will become the site of a bold new experiment in live performance. Authority Figure, directed by performance/dance/sound artists Monica Mirabile and Sarah Kinlaw, is an immersive and participatory experience exploring themes of surveillance, authority, and obedience. Appropriately vast in scale, it features over 150 performers (including a child and a pregnant woman), and has been created with six choreographers, seven installation artists, and six musicians, including local faves Pictureplane, SOPHIE, and Hot Sugar.